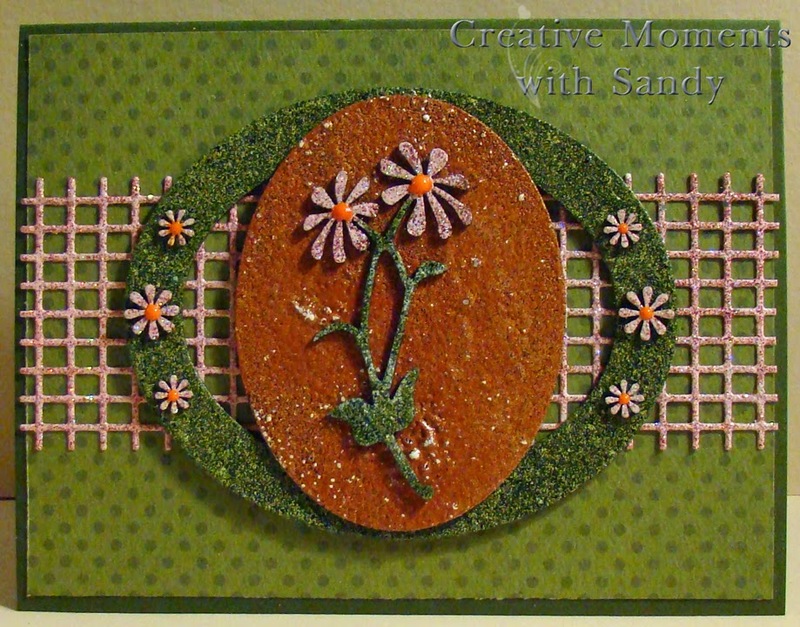 For my project today, I decided to think ahead to warmer climate and created this daisy card. I began by using the oval drop out from my snowflake ornament from last week. I embossed it with Brownstone Enamel Powder, lots of great texture to this one. For the Large Floral Daisy, I embossed the stems with Mossy Glen and the petals with Cranberry Wine Enamel Powder. I used the same Cranberry Wine on the small daisies from the Daisy Floral Accents set. I added a dot of Orange 3D Gel to the centers of each of the flowers. For the outer frame, an extra from an ornament set, I again embossed with Mossy Glen. Using white card stock, I die cut a Cheery Lynn Designs Burlap Mesh Border and embossed with Cranberry Wine Enamel Powder. Finished size is 4.25 x 5.5 inches. So to sum it up, we will be awarding 7 people who comment this week; Sunday, February 2nd through Saturday, February 8th a $10 store credit. Good luck to you all. I've been looking at all the creations and I am amazed. So pretty, looks like a garden! Love the colors, really springy! Stay warm in all that snow & cold. This is so stinking CUTE!! I love it! Love the colors of enamels you chose for your design, the orange centers of the flowers and the way you layered the ovals on the card. Makes you wish Spring was here. NEW RELEASE | A Lucky Pendant! Happy Winter Card & Last Chance to Enter! !